Fire is from the Bamboo Salt that is burned 9 times for a mineral infused explosion of energy. So this combination carries a powerful amount of nutrition and the energy behind it to propel it to areas that need nutrition and energy for health. 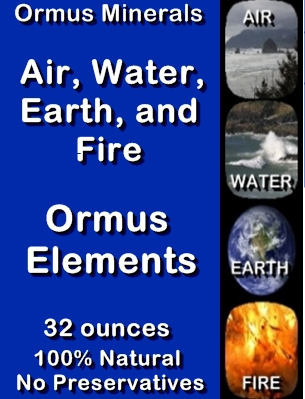 To bring together as many elements from nature possible that is of Ormus form so it could sing and vibrate its energy together for a full harmony of Ormus minerals.